Hello Summer! Salads are the best Summer food accompaniments or meals on their own right?! 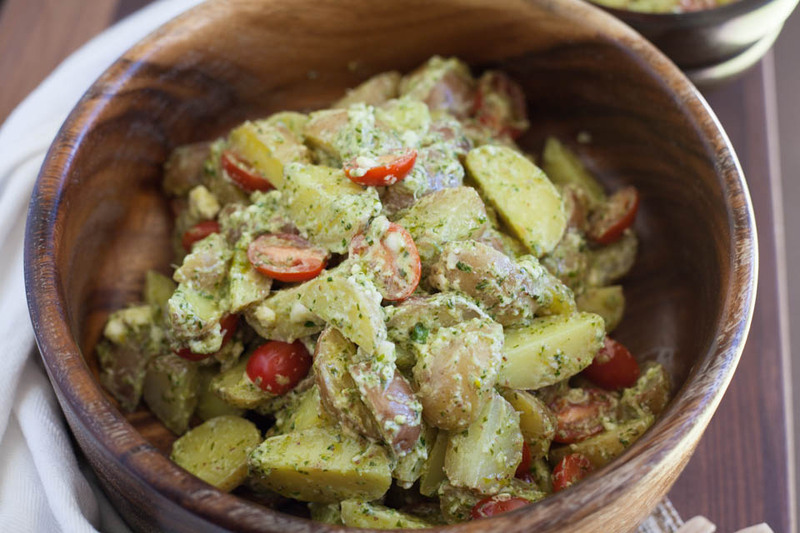 Well this Herby Olive Oil Potato Salad is a nice lunch, maybe with some tuna?!!! Yes please, I know what I’m eating for lunch tomorrow! But really it’s a great side dish for all of the grilling we’ll be doing all Summer long. You know how much I love herbs in all of the things, so making this herb dressing for a potato salad was a good idea. I have a secret, I have never, other than culinary school in front of the chef instructor, taken the stems off of my herbs. I always felt wasteful doing it, so I just never did and they never knew, unless they saw lol! But at home for sure I would never remove the stems, I simply use them. I grab the whole bunch of parsley and cut off the top what I need for a recipe, then chop it up stems included. The stems have so much flavor and have no business going into the garbage. Food waste in insane and that is flavor. I save the very bottom stem, sans the leaves, and add them to my juice and stocks. Just a tip for using every bit of food you buy! 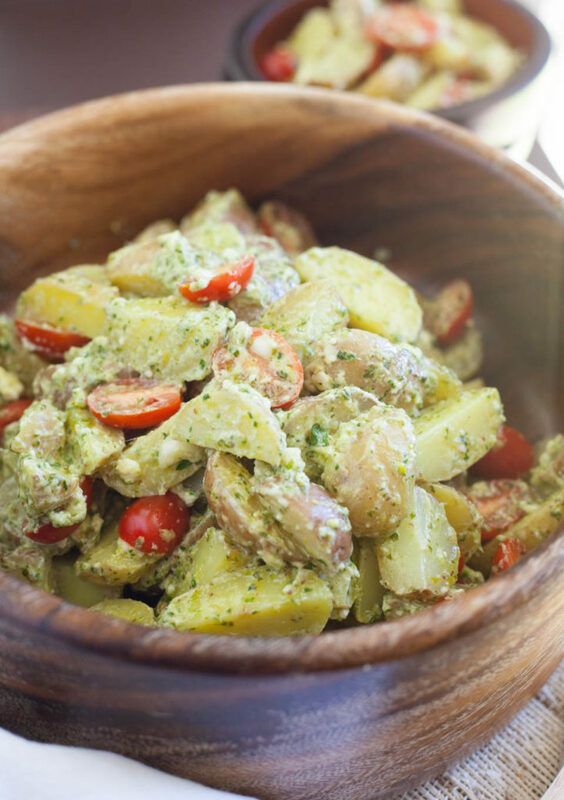 This lovely herby salad can be made a day ahead to get the dressing into the potato for even more flavor. Plus you can omit the feta to easily make this a vegan dish! Serve it with everything from fish tacos to more vegetables dishes, it’s super tasty and versatile! Fill a large dutch oven or pot with water about 1/2 way and add 2 tablespoons salt, bring to a boil over high heat. Once boiling add potatoes and cook just until fork tender, about 7 minutes. While potatoes cook, work on dressing. When potatoes are fork tender, drain from water and add to large bowl. 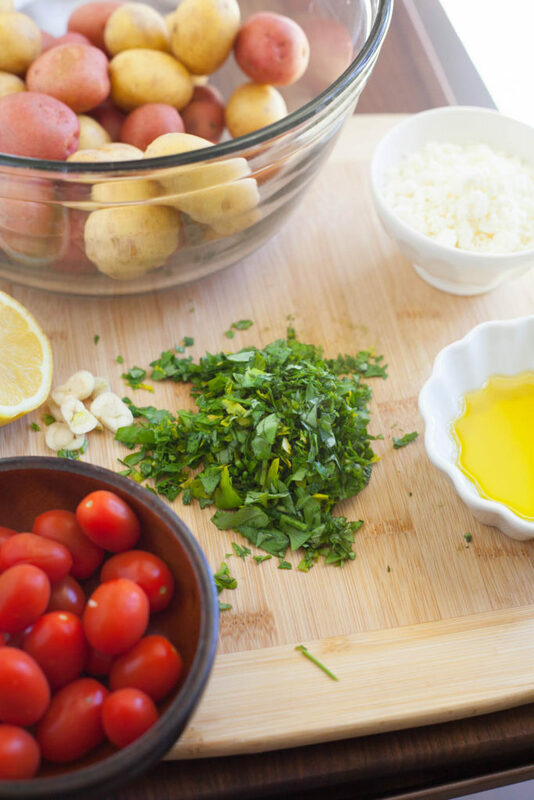 In a blender or food processor add herbs, lemon juice, mustard, and garlic. Slowly drizzle olive oil to mixture while on high speed, mix for 1 minute until emulsified. 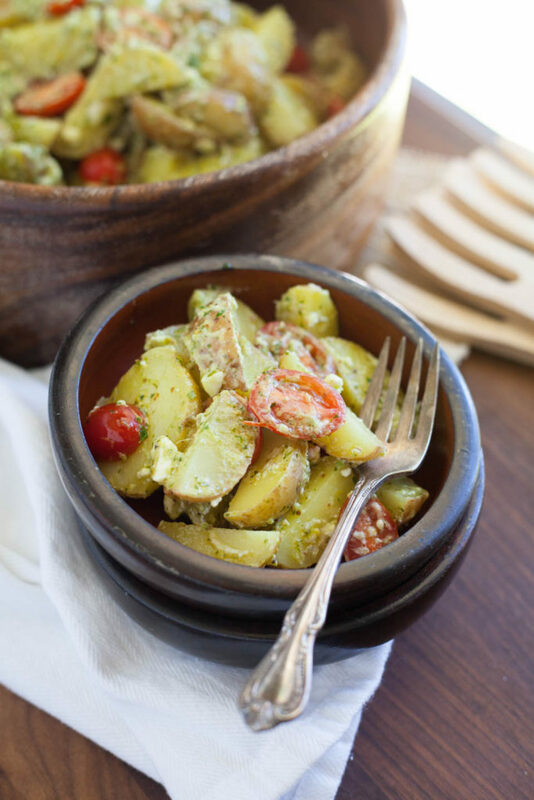 Add dressing to warm potatoes, gently toss with spatula to combine. Then add tomatoes and feta, gently combine. Taste for seasoning, add salt and pepper to taste. Serve immediately or chill in fridge for serving later. Store leftovers in fridge for up to 3 days. I’m so glad I’m not the only one who chops the stems up, too! Plus it’s just a real big pain plucking the leaves off. 😉 But it’s all good. Lol! Yay for ease and no waste! Thank you dear.